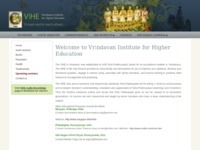 The official website of Vrindavan Institute for Higher Education (VIHE). It aims to provide training and instructions in brahminical knowledge, culture and skills relevant to management and preaching within ISKCON thus enabling devotees to become more effective in their services, to deepen devotee’s understanding, realization and appreciation of Srila Prabhupada’s teachings and movement, etc. Category ISKCON Outreach, Sastric Studies May 7, 2012 by ISKCON Desire Tree.